That's how many different kinds of adhesives I have in my "adhesive box." 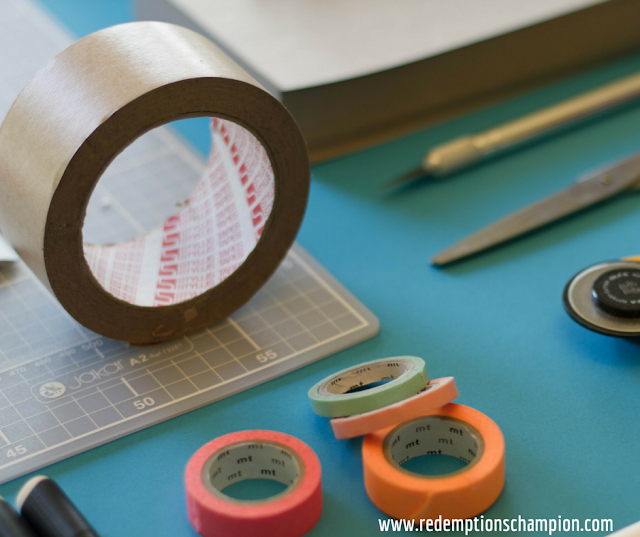 There are tape runners, glue sticks, double-sided tapes, various washi tapes and many, many others. Each one has a specific purpose. I'm an artist. As an artist, I use different kinds of glue for different things. The more I learn about art, the more adhesives I acquire. As I pondered my adhesive obsession today it dawned on me that my "adhesive box" is a lot like the Bible. When something ceramic breaks - I have a glue for that. When I need to adhere pieces of wood - I have a glue for that. When I'm making a card - I have several types of glue for that. Just like I have an adhesive for everything, I look to the Word of God for a verse for everything. When my heart is breaking - there is a verse for that. When I'm weary - there is a verse for that. When I'm lonely - there is a verse for that. Just as my "adhesive box" is an often used resource in my craft room, the Bible is an often used resource in my life. As I mature as a daughter of God the more verses I store up in my heart. I learn which verses are best for each situation. Don't wait until tragedy strikes to find a verse to see you through. My favorite adhesive in my box is called "sticky tape" - no joke this stuff could probably adhere a toddler to a wall. The Word of God has power, to hold us together in the tough times. Not just bandage us, but truly hold us together. I have my go-to adhesive for the tough jobs and I have my go-to verses for the tough times that life throws at me. When hard times come He will bring His Word to remembrance to comfort you and speak to you. He will then comfort others through you using the same comfort, His Word. Lots of people say they don't hear God, but I know He speaks to all His children. He's no respecter of persons. One way He speaks is through His Word, so if you are not hearing Him open up your Bible and hear what He has to say.